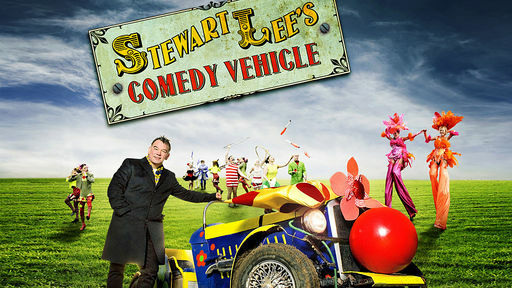 Stewart Lee returns to TV with this new show, and when he left – all of ten years ago – I mourned his passing. Together with Richard Herring he crafted two shows (Fist of Fun & TMWRNJ) which were full of life, joy, and intelligence. A favourite memory from the show involves a repeated joke where a guest would make a lazy ‘political’ gag at a soft target, only for Stewart and Richard to deconstruct it to the point of absurdity and humiliation. It was a surprise to me, then, that the ostensible targets of Stewart Lee’s new show were so soft. Celebrity books, Harry Potter, slapstick British sitcoms. He is no longer the arrogant young star, but a paunchy middle aged man, who has experienced some of life’s indignities, and his sarcasm veers close to bitterness. The intelligence still burns brightly, and the forensic analysis is combined with a new, daring, tendency to torture his audience by the repetition of a line until it becomes almost performance art. And I think that it is here that we find the real target of Mr Lee’s ridicule. Us – his audience. So perhaps his targets are not so soft at all. Its easy to mock a celebrity biography, certainly. Not so safe to mock us for buying them. At one point – when discussing the credit crunch – he demands that all those watching on a flat screen TV they have not paid for turn off the set and read a book instead. You haven’t earned the right to watch, he says, you are the cause of all the problems. Still, he makes me laugh but he makes me pay for the laughter with thought. The world needs more from Stewart Lee.